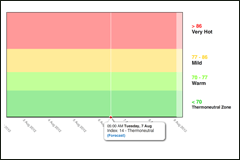 Internet-based Agricultural Warnings (IBAW) are calculated daily by Agriculture Victoria from 7-day digital forecasts provided by the Bureau of Meteorology (BoM), and give advanced warning of weather events likely to affect agricultural production. Newly shorn sheep and new-born lambs are susceptible to cold stress, which increases their risk of death. The graph shows the chill values (kJ/m2.hour) for unsheltered conditions, calculated from forecast wind speed, temperature and rainfall1,2. Mortality rates increase rapidly at chill values over 1000 kJ/m2.hour3. If there are periods of high chill within the forecast period, newly shorn sheep should be moved to sheltered paddocks to prevent deaths, and additional feed supplementation considered to generate additional body heat. Ewes should be moved to sheltered paddocks prior to lambing. Special-purpose lambing areas can be established with grass hedges to provide shelter from wind4,5. 2. 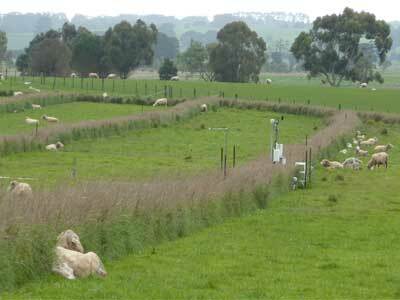 Wind speeds from the Bureau forecasts for a 10 m measurement height have been downscaled to a lamb height of 40 cm using an empirical relationship. Sheep are vulnerable to heat stress, particularly during occasional heatwaves in coastal areas that are normally mild. 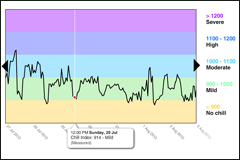 The graph shows the Heat Load Index1 calculated from solar radiation, air temperature, wind speed at sheep height, and humidity. Above a Heat Load Index of 74, the panting rate of sheep increases rapidly2. Young stock, wethers and terminal sires appear to be the most vulnerable to severe heat, with Merino ewes the most tolerant. If high heat load coincides with joining, ewes may fail to get in lamb. If a high Heat Load Index is forecast, vulnerable stock classes should be moved to paddocks with good shade and fresh clean water prior to the heat event. 1. Gaughan JB, Mader TL, Holt SM, Lisle A (2008) A new heat load index for cattle. Journal of Animal Science 86, 226-234. 2. Stockman CA (2006) The physiological and behavioural responses of sheep exposed to heat load within intensive sheep industries. PhD Thesis, Murdoch University, Western Australia. 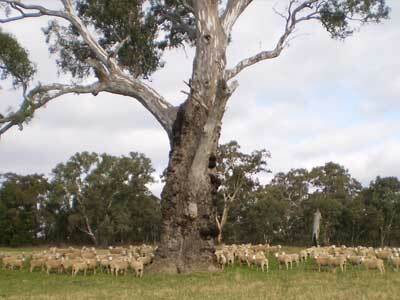 Sheep utilising the shade provided by a mature red gum near Ararat. Photograph courtesy of Rob Shea. Stored soil moisture affects plant establishment and the likelihood of continued crop or pasture growth. The graph shows soil moisture expressed between 0 and 100%, where 100% is the full soil profile (considered to be field capacity), and 0% the driest that each landuse has reached in the last 30 years (close to wilting point). The 'normal band' (coloured grey) indicates the interquartile range between the driest 25% and the wettest 25% of values for that date within the last 30 years. The annual crop is wheat, sown on the 'Autumn-break' (after 25mm rain has fallen in a 5 day period) between the months of April to July. Calculations are performed using the Catchment Analysis Tool1. Weather data are sourced from the SILO2 database. At each location, the dominant soil for the local area is used. 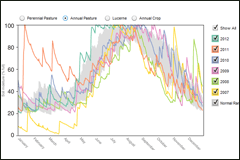 Livestock: In seasons where soil moisture is consistently close to or below the bottom of the “normal band” by the end of winter, there is a high probability that spring pasture growth will be below average. A management strategy to cope with a below average spring is to apply nitrogen fertiliser to pastures in late winter to generate additional feed while there is still soil moisture. If selling livestock it would be worthwhile looking at what parts of the State have above normal soil moisture and are more likely to purchase stores. The opposite occurs in seasons when stored moisture is above 'normal' in late winter, when there is a high probability that spring pasture growth will be above average. To capitalise on the extra growth, producers can consider purchasing additional livestock, or allocating extra paddocks to hay and silage production. Cropping: Nitrogen fertiliser decisions need to take account of soil moisture. In years when there is sufficient soil water to finish the crop, nitrogen applications in late winter have the potential to increase grain yield. However in years with below normal soil moisture, nitrogen applications can lead to reduced grain yield, because it increases foliage growth that more rapidly depletes soil moisture leaving insufficient for the grain-fill period. Nitrogen application should therefore only be undertaken when there is likely to be sufficient soil moisture for grain-fill. 1. Weeks A, Christy B, Lowell K, Beverly C (2008) The Catchment Analysis Tool: demonstrating the benefits of interconnected biophysical models. In 'Landscape Analysis and Visualisation'. (Eds C Pettit, W Cartwright, I Bishop, K Lowell, D Pullar, D Duncan) pp. 49-71. (Springer-Verlag: Berlin). 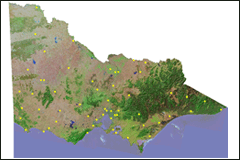 Internet-based Agricultural Warnings was funded by the Victorian Government 2010-2012. Project staff were Malcolm McCaskill, Subhash Sharma and Matthew Cox. During 2013/14 Internet-based Agricultural Warnings project staff were Malcolm McCaskill, Anna Weeks and Matthew Cox. Agricultural warnings are automated computer predictions provided by Agriculture Victoria, based on numerical forecasts from BoM. Check BoM warnings for official information http://www.bom.gov.au/vic/warnings. The forecasts are provided in good faith, and neither Agriculture Victoria nor BoM warrant the accuracy of the automated forecasts.